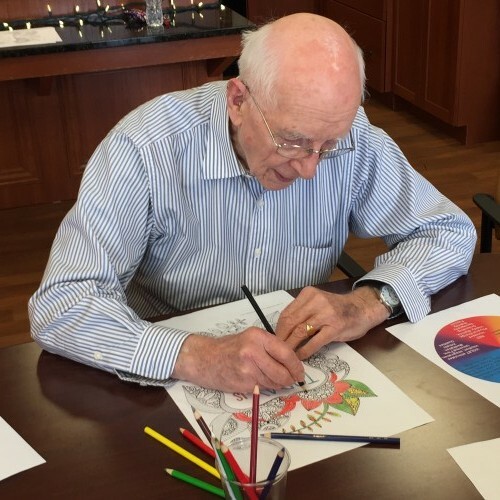 Tiffany Village and Kenny’s Pond Retirement Living have launched a “new” Colouring Series for seniors. Every week residents get together, listen to relaxing music and colour. Colouring for seniors is extremely therapeutic and can help generate wellness, quietness, mindfulness and the exact same benefits which meditation imparts on the brain. With popularity increasing every week, after just a few weeks, this amazing class now has full attendance and we’re always open to adding more spaces! Colouring has long been considered a therapeutic activity suitable to the young and old. Colouring evokes feelings of peace, enjoyment and satisfaction that are hard to beat. Revisiting this much loved childhood pastime is well worth the effort. Some people believe that coloring is only for children but ‘coloring’ as a hobby is quickly gaining momentum with adults and elders across the Country. These days, coloring books and pencils are being given to elders to maintain motor skills and hand-eye coordination. 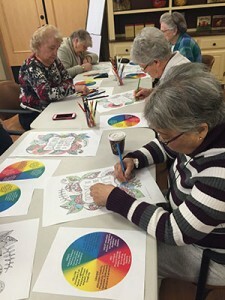 Research into the effects of coloring activities for people suffering from dementia show positive outcomes, most notably a decrease in agitation and anxiety. The therapeutic value of colouring comes in part from a participant’s need to concentrate and in doing so they may ‘forget’ their troubles whilst in the midst of a colouring activity; relaxation and meditative moods often follow.